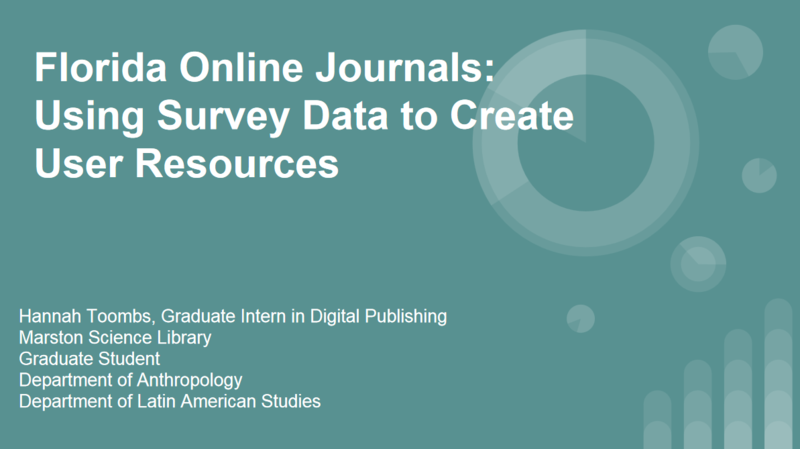 An introduction and resources to publishing with Florida Online Journals for UF scholars. Florida OJ is an open source digitial publishing platform produced by the Public Knowledge Project. UF scholars have access and technical support via FALSC. Florida Online Journals (Florida OJ) is an open source digital publishing platform developed by the Public Knowledge Project. UF scholars have a team of support available to assist them in using Florida OJ. 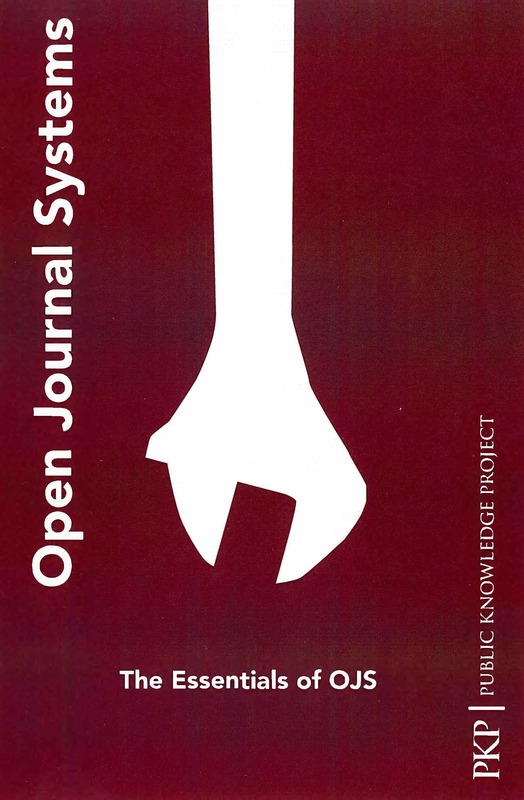 Florida OJ is the statewide installation of the Public Knowledge Project's Open Journal System which brings full capacity online publishing features to your fingertips! Why publish with Florida OJ? What can OJS do for you? Florida Online Journals is part of the Scholarly Journals program of FALSC. 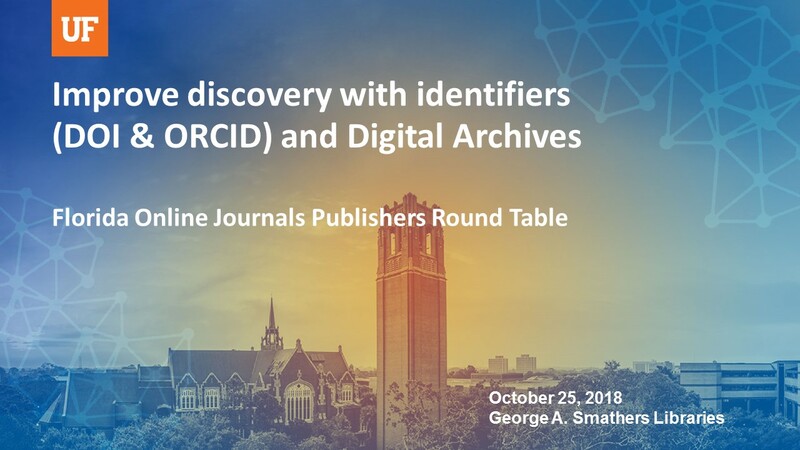 The Florida Online Journals Publishers Round Table is a collaborative group of UF Scholars who use Florida OnlineJournals or are curious about journal publishing partnerships with the UF Library. 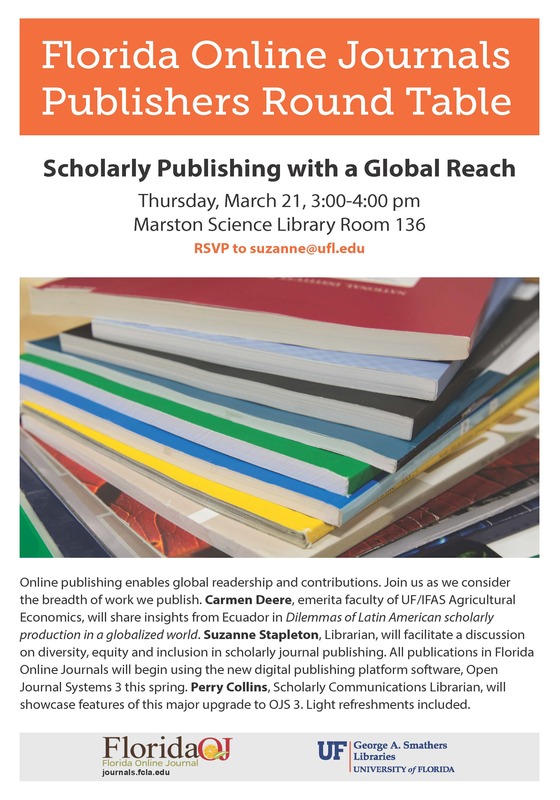 We meet once a semester in Marston Science Library to share experiences, hear updates and further develop a useful network of scholarly journal publishers on campus. Read Dr. Carmen Deere's full paper on Dilemmas of Latin American scholarly production in a globalized world here. Email Suzanne Stapleton to receive notifications of upcoming events. Coming Soon! Annual Survey of Journal Publishing Partners will be distributed in Spring 2019. See survey results from 2018 by clicking the slide below. 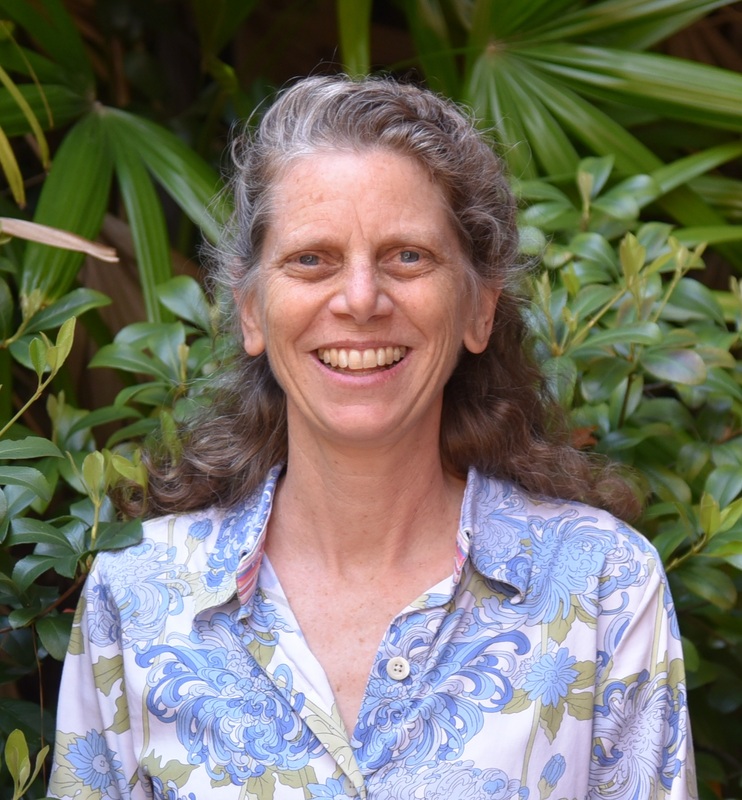 Hannah Toombs, Graduate Student Intern in Library Publishing for Spring 2018 conducted a survey of UF editors and journal managers using Florida OJ as a publishing platform. The content of this LibGuide is designed, in part, in response. 7. When ready, make your journal site in Florida OJ public! !